1) Soak sticky rice for at least an hour or overnight. 2) Steam the rice on medium-high heat for 20 minutes, until the rice are cooked. 3) Add ½ cup of coconut milk, 1½ tsp. sugar and ¼ tsp. salt to a saucepan. Stir over low heat, until the salt and sugar are dissolved. Remove from heat and set aside. This sauce will be used to season the rice. 4) In another small saucepan, add in ¼ cup of coconut milk, 1½ tsp. sugar and a pinch of salt. Stir over low heat until the ingredients are dissolved. 5) Mix the tapioca starch with some water until it forms a paste. Add in the paste and stir until the sauce thickens. Remove from heat and set aside. 6) When the glutinous rice is cooked, spread them out in a shallow bowl. Drizzle half of the first sauce you made over the rice. Stir the rice and sauce together, adding more sauce until you reach the saturation point (usually 75% of the sauce will be used). As a rule of thumb, add the sauce until you see puddles of coconut milk, but the rice should not be totally submerged in the sauce. 7) Stir well and cover with a towel. Allow the rice to absorb the sauce for 10 -15 minutes. 8) In the meantime, cut the mango and arrange the fruit on the plate. 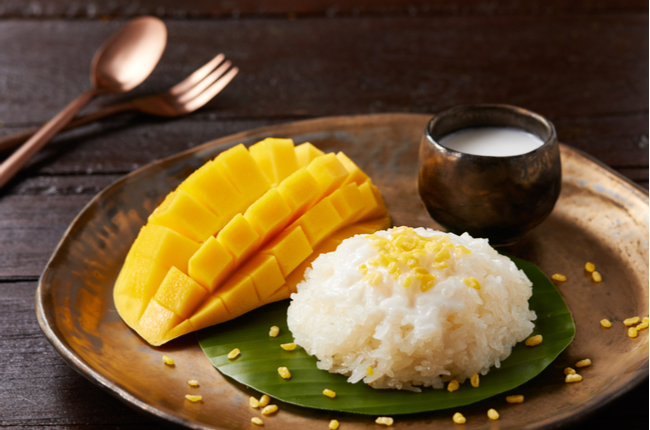 Spoon an equal amount of the seasoned rice and place it next to the mango. 9) Top the sauce and mango with a few spoons of the thicker sauce. 10) Garnish the dessert with some toasted sesame seeds for the extra crunch!